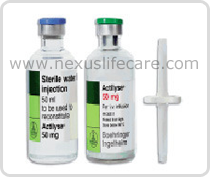 Uses:- Actilyse Injection is intended to be used either during the early stages of a heart attack (caused by blood clots in the arteries of the heart) or in a condition of the lungs known as acute massive pulmonary embolism (caused by blood clots in the arteries of the lungs). Side Effects:- Nausea and vomiting caused by bleeding into gastrointestinal tract. Reperfusion arrhythmias, which can be life-threatening and may require the use of conventional anti-arrhythmic therapies. (When alteplase is being used for the treatment of MI) Hypotension. Increased temperature.